Isla del Carmen and Isla Danzante are two of the five islands that make up the Loreto Bay National Marine Park. 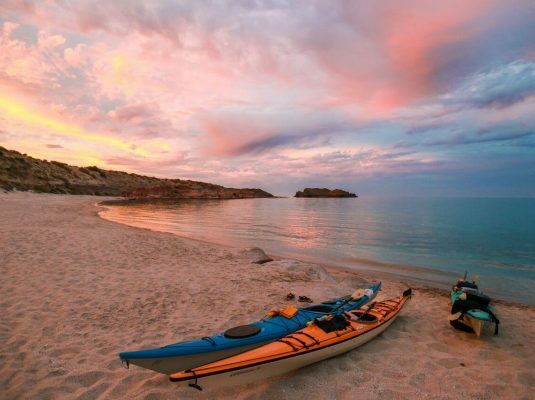 The campsites boast rugged coastal vistas, each more beautiful than the last, and the animals around the islands can include dolphins, whales, sea turtles, mobulas, and over 800 species of fish. Seabirds dot the sky above. 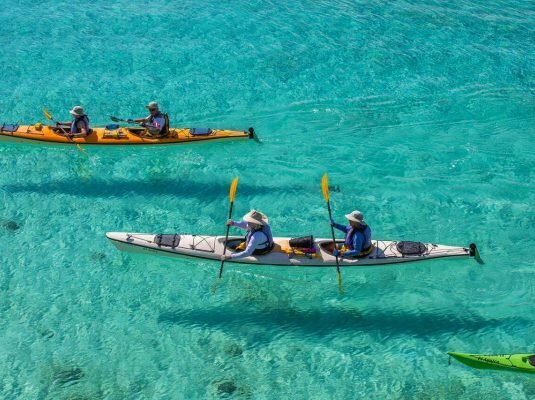 For six to seven days, you will kayak around the two islands, discovering their secrets with assistance from our experienced, professional trip leaders. A Panga provides support, carrying our gear and allowing you to focus on having a good time. 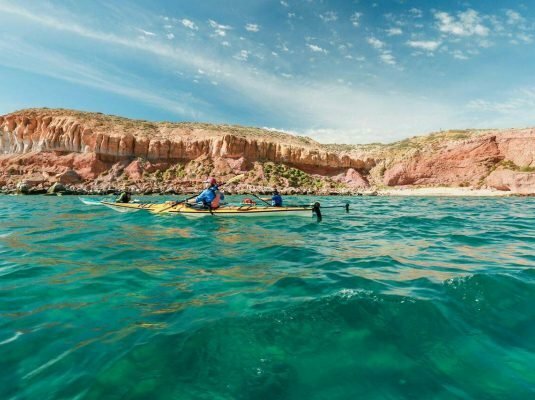 Stand up paddle boards and snorkeling gear are both available, and both worth using: the tranquil waters of Loreto Bay make for great paddling, and the Sea of Cortez has been called “the world’s aquarium” due to the immense variety of life forms you can find in it. At Sea Trek, we make sure to hire guides who know the area and work together well. 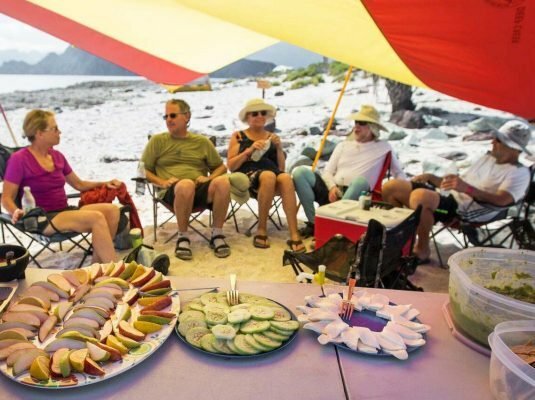 We think of ourselves as one large family, and whether you are slicing your kayak through the bay’s turquoise waters, relaxing at a camp in an island paradise, or exploring the abundant lifeforms in or out of the water, you will feel that family spirit. 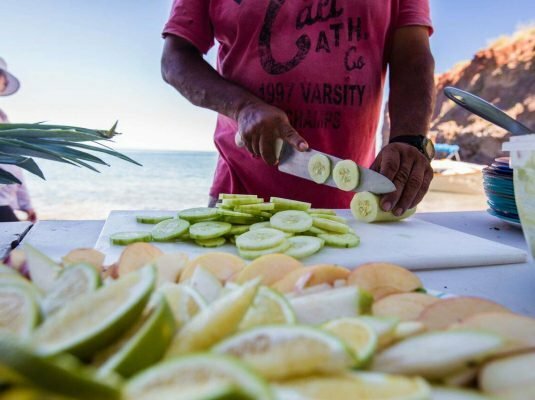 All Sea Trek Baja trips start in the quaint little town of Loreto, located on the Baja peninsula about 600 miles south of San Diego. In most cases there is only one inbound and outbound flight a day, so our afternoon/evening meeting on day 1, and our end of trip logistics are built around that timing. Call us at 415-332-8494 to book a trip today! Please fill out the following form to book a trip and we will get back to you as soon as possible.